Kindness Boomerang contains 365 daily acts, one for each day of the year, accompanied by inspirational quotes, personal stories on the power of paying it forward, and tangible steps to change your outlook on life. This book empowers you to bring positivity into your everyday life and the lives of those around you. Wahba invites you to practice kindness in relationships, kindness with yourself, kindness with nature and kindness in many more forms. This book is a call to action for anyone who wants to live a more connected and fulfilling life. Orly Wahba is an educator, entrepreneur, and activist passionate about inspiring people to embrace the power of kindness. She began her career as a middle school teacher in Brooklyn and for fifteen years has worked with youth and local charities. Wahba is known for incorporating kindness, love, and respect into curricula. She founded Life Vest Inside in 2011, is the writer and director of the Kindness Boomerang video, and has spoken about its mission to many audiences, including in a TED talk. "We are powerful beyond measure when we are kind—when, through simple kind acts extended to others we help a fellow human feel better and they in turn pay it forward. No one knows this better than kindness guru Orly Wahba. Her inspiring daily guide Kindness Boomerang is the tool we all need to tap into our goodness, unlock our kindness, and unleash that kind self upon a suffering world." -Tony Hsieh, author of the New York Times bestseller Delivering Happiness and CEO of Zappos.com, Inc.
"Orly Wahba has composed a modern day bible. These lessons of kindness are desperately needed by a world that has lost its way." "Orly Wahba has produced a treasure trove of kindness. This little book can help change the world for the better, one person at a time. It's wonderful." "The world's greatest untapped resource? The kindness in each of us. And it's free! Imagine if we all practiced Orly's 365 daily acts of kindness. Everything would change." "Kindness Boomerang fills a gap in the literature, giving youth and adults the gift of renewed kindness every day. 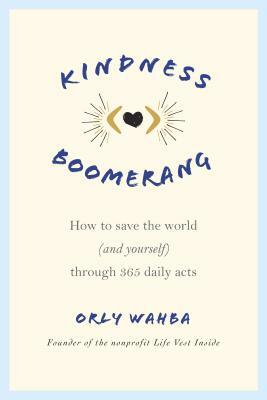 Orly Wahba shares her gift of living kindness with authenticity that helps all readers see how easy it is to truly make the world a better place. You can read it day by day, or you can imagine sitting with a friend and a cup of tea while reading and growing inspired; either way, you'll find kindness really is like a boomerang. It always comes back to you and that is beautiful." "Orly has written the definitive guide to life. Kindness is what it's ALL about." "If you’re looking for inspiration, motivation, or action, this book will 'kindly' get it done. Go ahead and open to today’s date. It will make your day, and maybe even change your life. You will quickly realize, there’s no one quite like Orly."